I always feel sorry for co-workers who don’t normally work Friday nights get stuck working with me on Friday nights. I’m used to having no social life and plucking away while the rest of the country is gearing up for the weekend. This past Friday, I had a co-worker who switched at the last minute with my regular nightside partner out of the sheer goodness of her heart. He had been invited to a wedding last minute so she stepped up and switched shifts with her so he could go. It was a pretty easy night and we got to a stalled point in the evening. I asked if she wanted to find something for dinner. Normally at work, we pick up fast food or find a quick sit down place, but we had some time and I knew she was in a bad mood because she was stuck at work on a Friday night, so I suggested a nicer place that I’ve been wanting to try. I chose Flat Lander’s Barstillery on Michigan Avenue just east of of Eastern Avenue. It’s in a new mixed use development. I first heard about the place about a month when I saw it as a new addition on Urbanspoon. I pointed it out to J, but we don’t really take a lot of trips to Grand Rapids and when we do, it’s always with a toddler. The bar is on the corner of the strip mall. There’s a large parking lot in front and off to the side of the building plus it’s right on a bus line. When we pulled up, I noticed the patio was full and I thought we might be out of luck. We had time to eat, but we didn’t have time to wait for a table. The space inside Flat Lander’s is awesome. It’s a multi-level lay out with a very whiskey cellar like feel to it. There is a small ball when you first walk in to the place and there are different dining spaces on three different levels in the space surrounding the bar. C.W. noticed a table on the bottom level, so we headed down there to grab it. A waitress followed with a couple clip boards that had the menus attached to them. The main attraction at Flat Lander’s is the home made spirits. They distill their own rum, gin, vodka, whiskey, and bourbon. They are all made with Michigan water and Michigan grains. Unfortunately, we had to flip past the first three pages that comprised of the drink list because we were still on the clock. As much as I wanted to partake in a Ol’ Fashioned or Flat Lander’s Appleshine, I had to order a Coke….oh, they also have a pretty good craft beer list that I had to pass on as well….so this was a tough stop in the drink department. I didn’t have any decisions to make with dinner. The first thing on the “Handfuls” portion of the menu was calling my name. 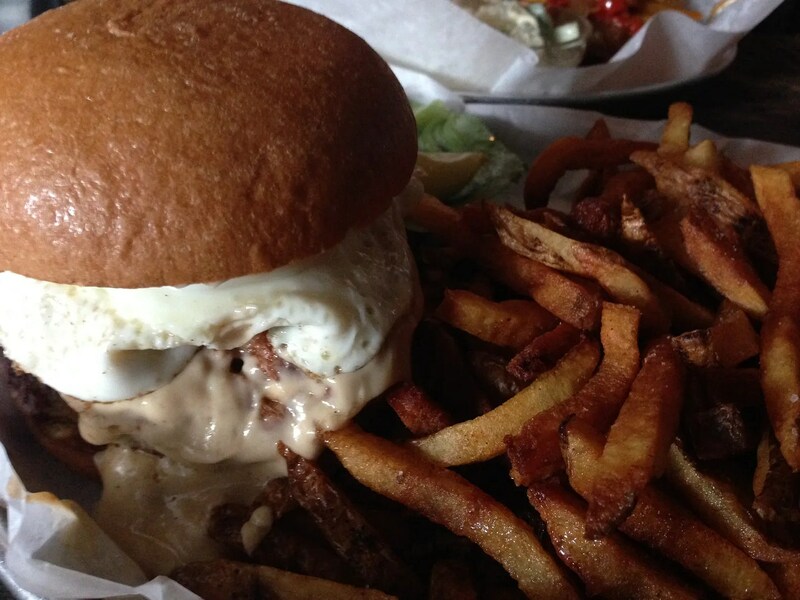 The Flat Lander Burger is an amazing concoction of a 1/2 lb local beef patty that has been grilled then topped with a house beer cheese sauce, smoked bacon, pulled pork, and a fried egg. It’s served on a brioche bun and supposed to come with chips, but I upgraded to House Punched Fries instead. The sandwich was a mess, but soooo good. The beer cheese was oozing out all sides which made the pulled pork slide out as well. I grabbed on tight and did my best to bring it to my mouth without looking like a slob…but yeah…that didn’t happen. Everything about this burger was amazing. From the simple beef patty made with local beef to the fried egg that topped it off, there was nothing about this burger that I didn’t like. The House Punched Fries were a good choice to an upgrade. They are pretty thinly cut and cooked to a nice crispy outside. There a lot on the plate and when C.W. started looking at me with puppy dog eyes wanting to try them, I offered up my plate. The burger itself would have been enough for most people, but I’m not most people and if there’s food sitting in front of me, I’m going to keep eating. I was happy to share them with her so I didn’t make myself out to be a total pig. C.W. had a little bit harder time deciding on dinner. She was torn between the Fish Tacos and The Bird Cage. She eventually picked The Bird Cage which is a grilled farm fresh chicken breast topped with smoked bacon (she got on the side and gave to me….she’s weird and doesn’t like bacon), grilled onions, grilled peppers, cheddar cheese and a sweet and spicy mustard. Like my burger, her sandwich was served on a brioche roll that could barely contain all of the goodness inside. The thing she made sure to mention to me was that the sandwich has a very strong mustard flavor to it. She said it was by far the dominate flavor. Not complaining about it, but she said you really better like mustard if you order this sandwich. Her sandwich was also supposed to come with chips, but she, instead, ordered the Chunky Potato Salad. The menu description just says “Just like mom made with eggs and all.” C.W. took a bite and simply said, “Awesome.” She loved the potato salad. We did our checks separately and each of us spent around $13 on food. C.W. also bought a t-shirt so her bill was about double that when all said and done. 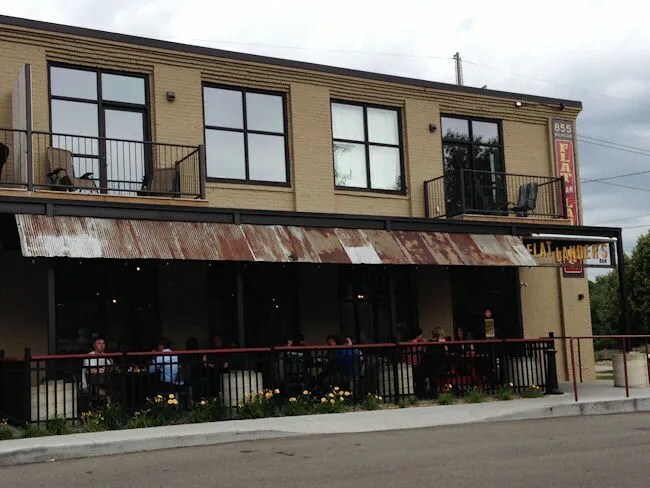 Flat Lander’s is another great, local, farm to table type of place. I really wish I could have taken in some of the spirits, but it just couldn’t be done on this trip. 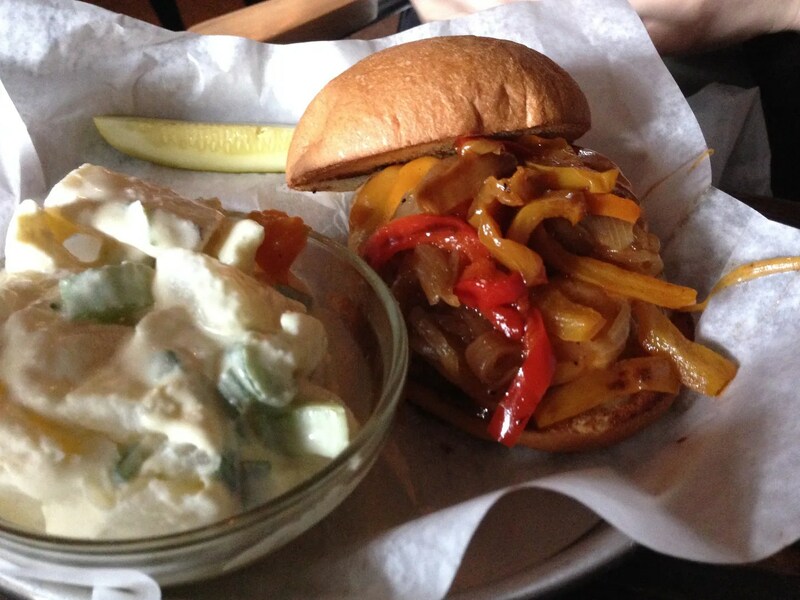 Just based on the food alone, Flat Lander’s a place you need to check out. If you like your liquor, even better. Both of those meals look fantastic! 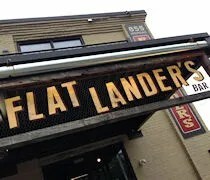 I’ll have to stop by Flat Landers the next time I’m in Grand Rapids.